​Free drinks reception, 2 course meal, live band: International Party Doctors, spot prizes, raffle, auction and more! 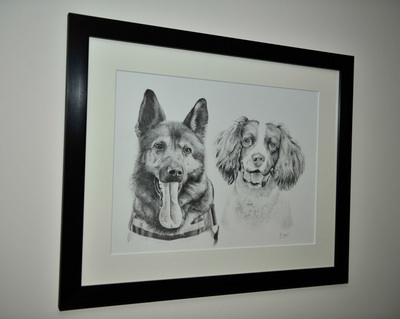 - All to raise funds for PawsUp Retired Police Dog Benevolent Fund. ***Limited Edition** Must be pre-ordered before 19th October 2017! 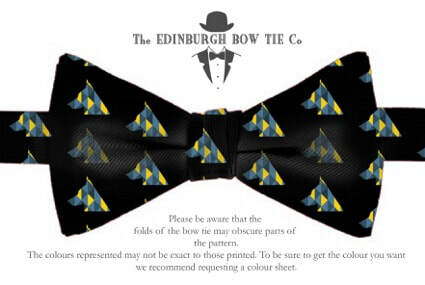 Made exclusively for PawsUp by The Edinburgh Bow tie company these silk ties are perfect if you are attending the PawsUp Christmas Party, we've decided to make them pre tied - imagine trying to line up the knot and the logo each time!!! matching pocket square available as well. Our mascot 'Bob' has become an integral part of the charity and is hugely popular, with literally hundreds already finding new homes and going on their own adventures. We have a dedicated 'Where's Bob' gallery on the website, so that his new owners can share their photographs of him on his travels. At this year's BikeWise event on Sunday 24th July 2016, one of our supporters (and Roads Policing Unit officer) PC Mike 'Spike' Fisher decided to run a competition whereby anyone who bought a Bob mascot on the day was invited to send their photographs to us during the following week, and the owner of the best picture won a special day to meet some of our very own Police Interceptors / Police Dogs / have a ride in an marked Interceptor car / and spend some time finding out more about what we do and try some of our equipment. Well ...... we were amazed at the response ! Hundreds of photographs were submitted and it was obvious that a lot of thought and effort had been applied. It was quickly apparent that to choose just one winner wouldn't have been fair, so we held another event for about 10 families as runners up. Some photographs are shown below. A great time was had by all and we couldn't believe that people had even travelled all the way from Surrey to join us for the day !! A final special mention must go to our overall winners - Noah, his brother Henry (pictured in hospital) and their parents Anna and James. ​ From all of us - we wish Henry a speedy recovery and good health for the future. 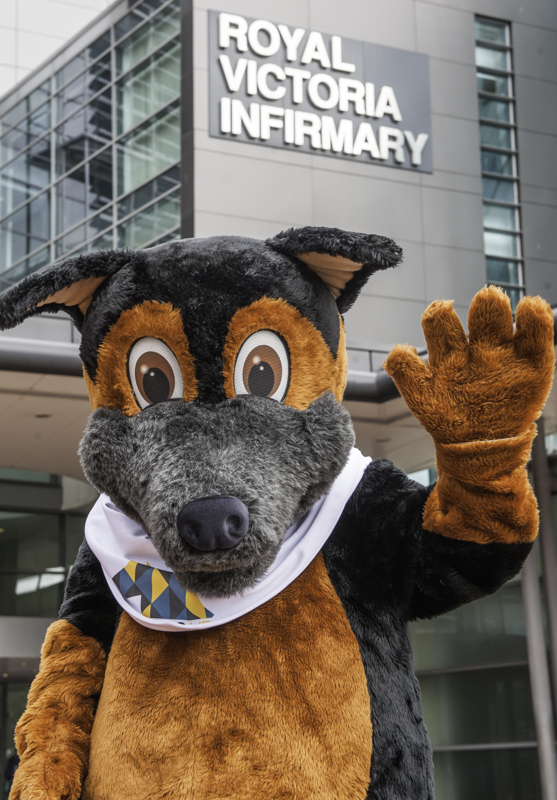 Firstly - a HUGE thank you to everyone who has purchased the PawsUp mascot 'Bob'. 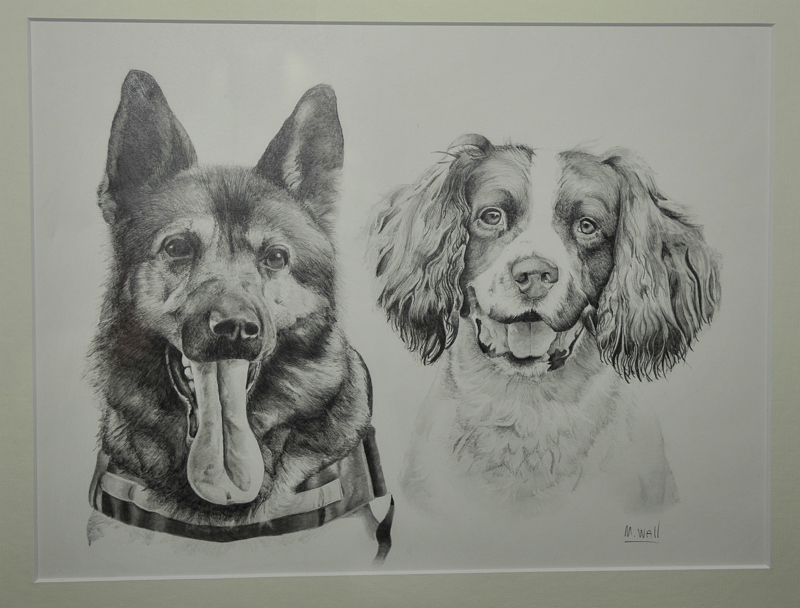 Your generosity will go towards ensuring a more comfortable life for our retired Police Dogs, as all proceeds go directly to their benevolent fund. For those that weren't aware, PawsUp forms part of Durham Agency Against Crime, which is a registered charity directly involved with Durham Constabulary. The idea of Bob was 'born' soon after the inception of the fund in the summer of 2013, and he has proved to be a big hit with young and old alike ever since. We are now the only outlet that supplies this particular soft toy and have him specifically made for us alone .. hence the bespoke ear tag that comes with him. A little bit of history : Bob was named in honour of actor Eric Richard - a close family friend of one of our founders - who is more famously known as Sgt Bob Cryer from ITV's 'The Bill'. Coincidentally, and especially for those that bought a Bob at this year's BikeWise, Eric was guest of honour at the first ever BikeWise event which was founded by another Bob ... a great friend and supporter - Bob Brown ! If you visit the 'Where's Bob' album in the 'Galleries' section on this site, you will see some fabulous photographs of Bob on his travels both in the UK and all over the world, and images of him doing something interesting , funny or just a bit different ! That's the kind of thing we're after .. Don't be shy or afraid to ask peoples permission.. experience has shown that most are understanding when you explain why you've got a camera and a stuffed dog under your arm ! Try and get Bob to be obvious in the picture but ensure that the the surroundings / location / object of interest he's with is clearly visible too, so all can see why or where the picture was taken. Use your imagination but - PLEASE DO NOT DO ANYTHING THAT WOULD PUT YOU IN DANGER !! We are currently running a competition for the best 'Where's Bob' photograph, with a fantastic prize of the opportunity to have a special ride out in one of our Interceptors cars !! 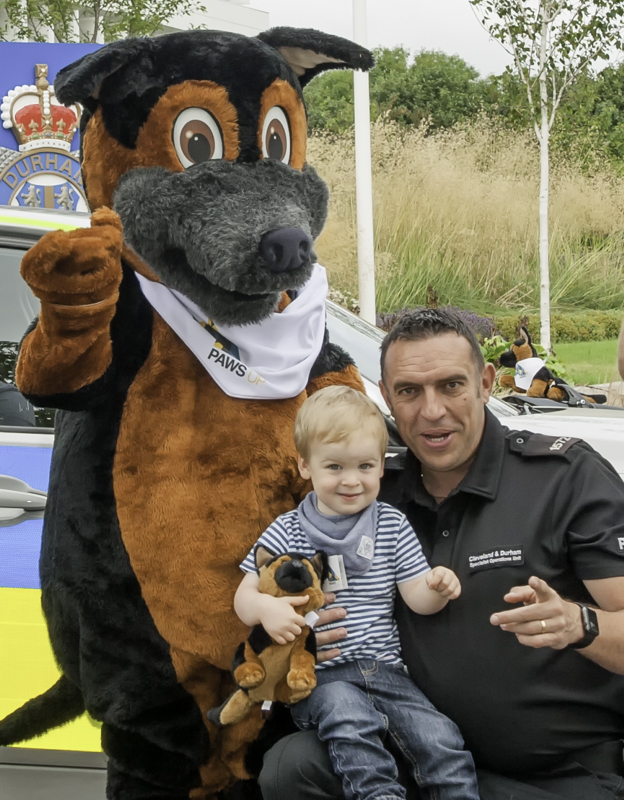 A special thanks must go to our very own Roads Policing Unit star of Channel 5's Police Interceptors - 'Spike' Fisher who came up with the idea at last weekends BikeWise event. All entries must be submitted by midnight on Saturday 30th July 2016 and the winner will be chosen soon after. 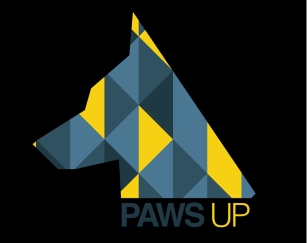 Please note that all admin relating to PawsUp is coordinated by serving Dog Handlers in their own time, so unfortunately this can sometimes lead to delays in replies and postage of items. We apologise for any inconvenience this may cause, especially for those that have ordered their 'Bob's' online and don't receive them in time for the end of this competition. But don't worry too much ... we're sure to run a similar competition soon ! 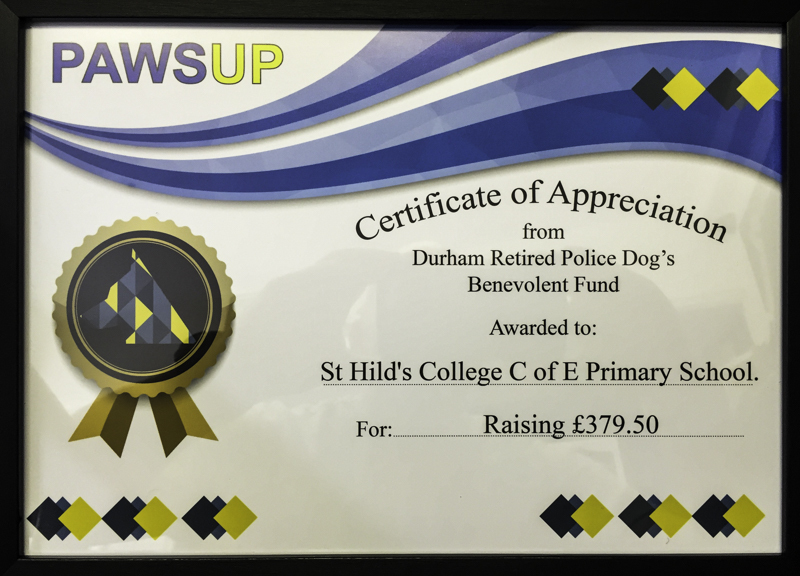 On Friday 24th June 2016 the pupils of St Hild's Primary School, Durham held a fundraising event all in aid of 'PawsUp' !! 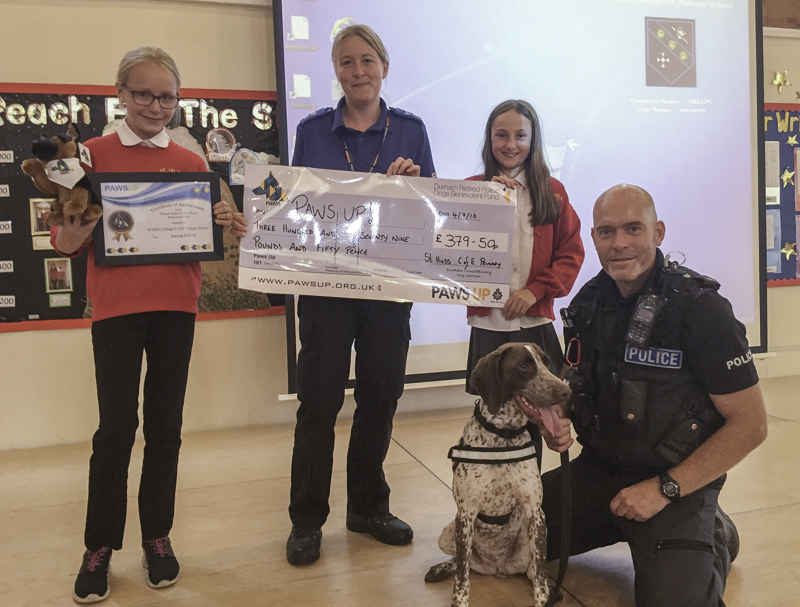 Activities included a dress down day, cake stalls, sales of PawsUp merchandise and games which resulted in the children raising an incredible £379.50 !! This was a fantastic achievement by all involved and a special thanks must also go to Durham PCSO Claire Kerr (Jet & Ben) who assisted on the day. Unfortunately, due to operational commitments, no Dog Support Unit officers were able to attend on the day, so today (Monday 4th July) PC Squire, along with PD 'Lottie' attended the school for a special assembly to say a BIG Thank You to everyone involved, and present the children with a certificate of appreciation along with their very own 'Bob' mascot. Once again, a HUGE THANK YOU to all the children and staff for their efforts. 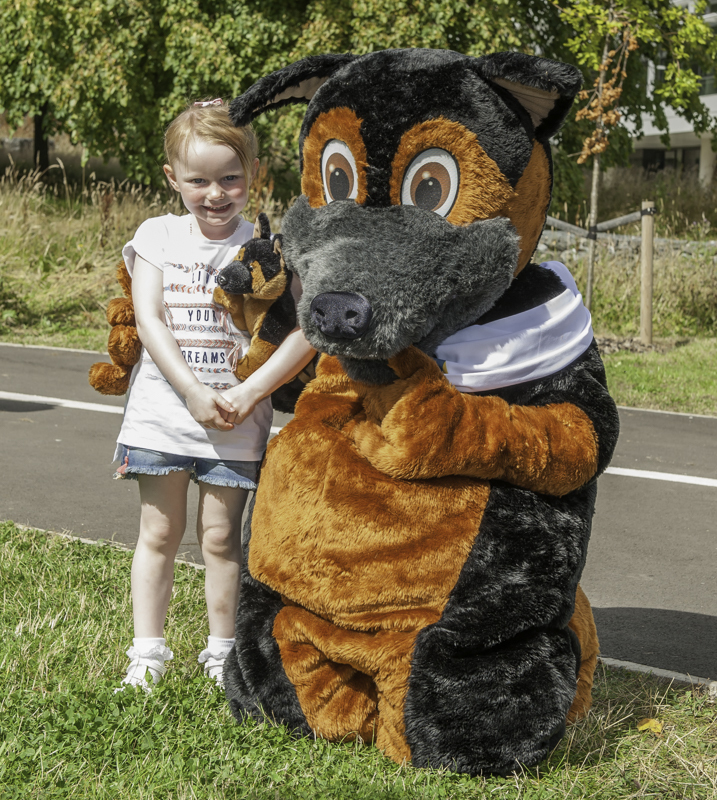 Due to circumstances beyond our control, we are sorry to announce that this year’s ‘DogWise’ event will not be taking place. We have supported this hugely popular event, that attracts many thousands of visitors, since it’s inception, and have become a very popular and integral part of the day’s attractions. Due to the loss of our standalone ‘DogWise’ event (for this year only !) we are hoping to provide a bit more than usual on 24th July by way of more demonstrations and a few extra supporters / companies assisting us with their own displays and merchandise stalls. 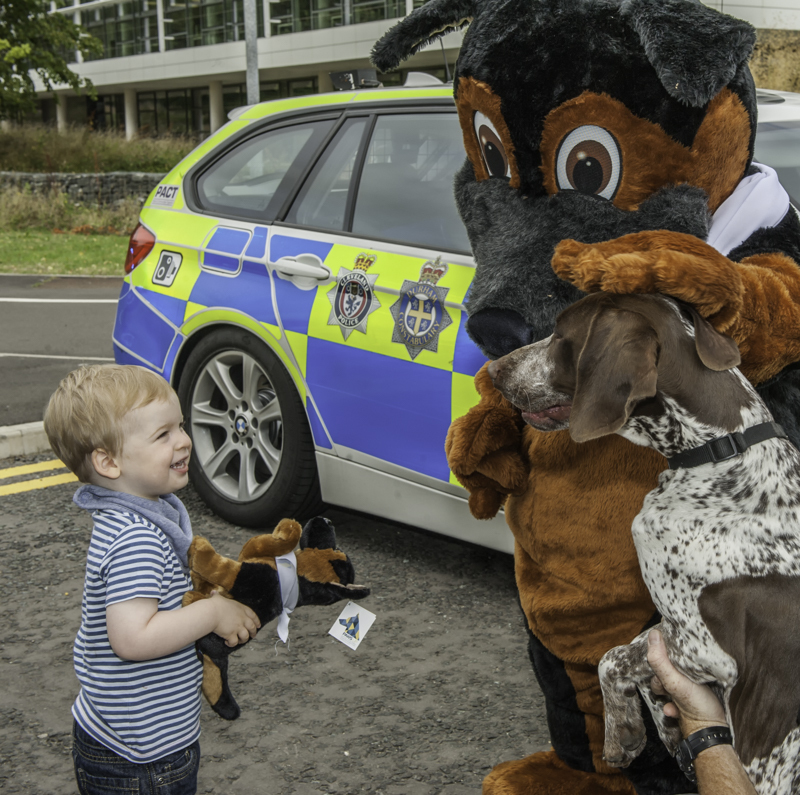 As usual, there will be plenty of the Dog Support Unit's handlers and dogs to meet and chat with. Welcome to our newest member of the team.. 16 month old Pointer x Springer Spaniel 'Lottie'. Newly qualified in Drugs, Weapons and Currency detection. For more information and a chance to see Lottie in action, please click on the image above. 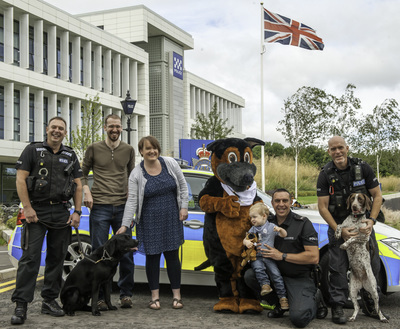 Enter the raffle for a chance to win a framed & signed print depicting the title image of this years Channel 5 'Police Interceptors' programme, and featuring some of the officers from the CDSOU that participated in the show. We've even managed to get the Police helicopter crew and both Durham and Cleveland Chief Constables to sign it ! rawcut have kindly allowed the reproduction of the picture which has been printed, framed and donated by our good friends at 'Durham City Studios' Claypath, Durham City. NB *** Each £1 entry will be transferred to a raffle ticket & drawn against others purchased in person. All proceeds from this raffle will be received by PawsUp. Prize draw to take place in mid December & remember to add your telephone contact details to the purchase form - use the 'special instructions to seller' option. If practical, the winner will be invited to collect their prize in person and get the chance to meet some of the officers (and dogs !) who feature in the programme. Buy your raffle tickets below!! A chance to win some terrific prizes ! 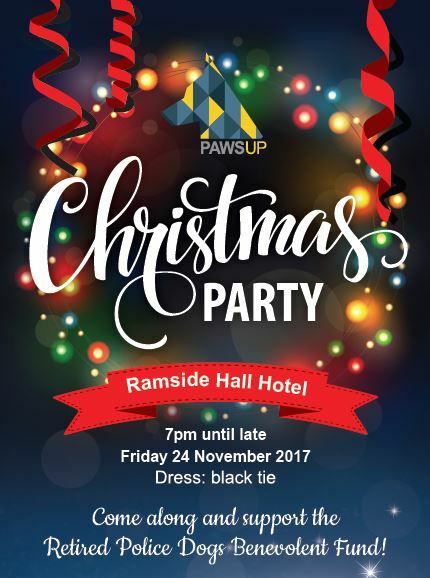 This Friday sees the annual PawsUp charity dinner, and as usual we have some terrific auction and raffle prizes to be won. We wanted ALL our supporters to have a chance of winning a selection of the prizes, without even being at the event !! .... 'By proxy' if you like. We have listed 5 selected prizes below. If you would like to bid on any of them, email us at durhampolicek9@gmail.com (or use the 'contact' section on the site) and tell us which item you're interested in, and your MAXIMUM bid. ​DO NOT make a payment yet. Your bid will be entered during the auction on Friday night. If your bid is the highest on the night - YOU WIN !... it's as simple as that. Failure to make payment within the specified time will exclude you from receiving the prize, and it will be offered to the next highest bidder. All bids need to be submitted before 4pm on Friday 11th December 2015. Any bids submitted after this time will not be included in the auction. 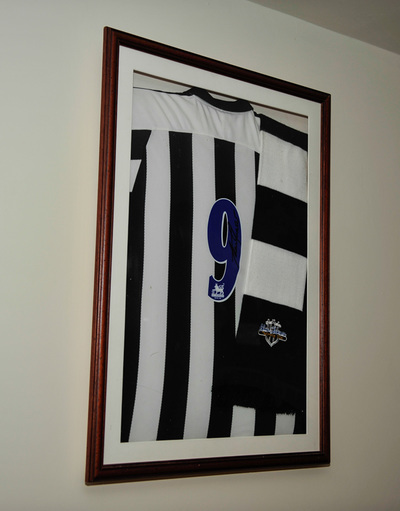 ​Newcastle United Shirt, mounted, framed and signed by Alan Shearer. Includes a scarf from his 2006 testimonial year. Wooden frame with perspex front. ​This is a used item and the perspex does show some wear and tear marks, but could easily be replaced. Original pencil drawing depicting 2 of our currently serving Police Dogs. This outstanding drawing has been donated by a very talented, young local artist and student - Michael Wall. This is the one and only original picture. 4 Ball round of golf on the Filly Course at Close House Golf Club. ​The Lee Westwood Filly course at Close House was originally built as a nine hole course in 1964 by Newcastle University for the use of staff and students and was extended to 18 holes in the early eighties. The mansions house and golf course were bought from the university in 2004 by Graham Wylie, founder of Sage and TSG and Has since seen substantial investment, to make Close House the premier location in the North East not only for golf but also for conferences and fine dining. The 18 hole course is situated in the grounds of the Close House Estate, providing stunning views of the River Tyne Valley. The Parkland Layout was re-designed and re-opened in 2007. It now has 18 USGA specification greens, is 6000yds in length and a par 70 from the medal tees. The undulating greens provide a real test for your putting skills, but accuracy off the tee is paramount for good scoring. Having already held PGA professional events the course has proved challenging to golfers of all abilities. visit ​closehouse.com for more information about the course. 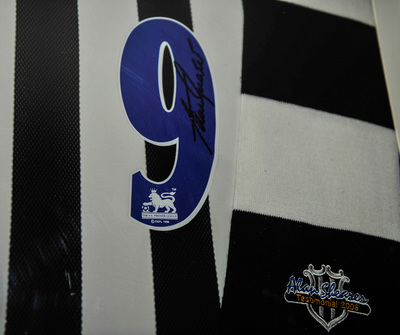 ​Contact details will be provided to the winning bidder. 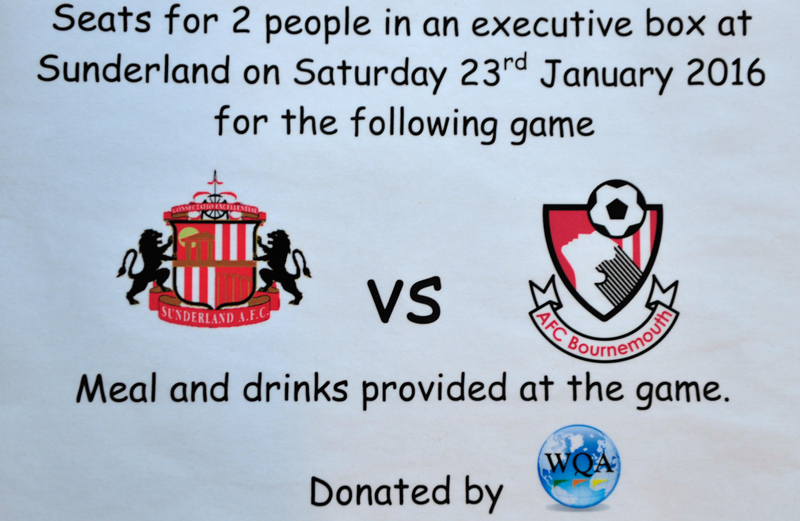 Seats for 2 in an executive box at The Stadium Of Light. Valid for Saturday 23rd January 2016. Seats for 2 in an executive box with meal and drinks provided. ​Wynyard Golf Club is one of the UK's top golf destinations and a luxury venue for wedding receptions, civil wedding ceremonies, business conferences, social events and dining. 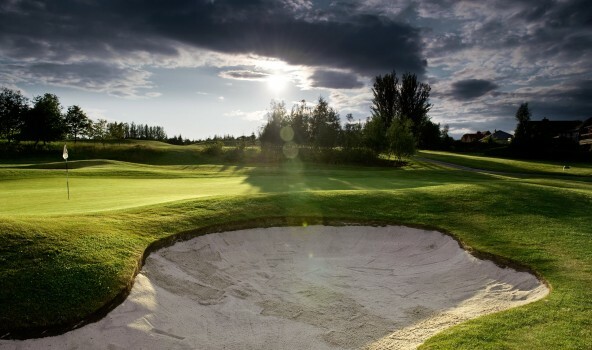 Set on the exclusive Wynyard Estate near Teesside, Hartlepool and County Durham, Wynyard Golf Club attracts keen golfers who enjoy an excellent test of skill playing the championship Wellington Course. Immaculate course conditions, all year round play, a classic golf course design and superior standards of service, hospitality and professionalism make Wynyard Golf Club one of the North's most popular golf, wedding, business and hospitality venues. Contact details will be provided to the winning bidder. Visit - Wynyard Golf Club for more information about the course. New Product? 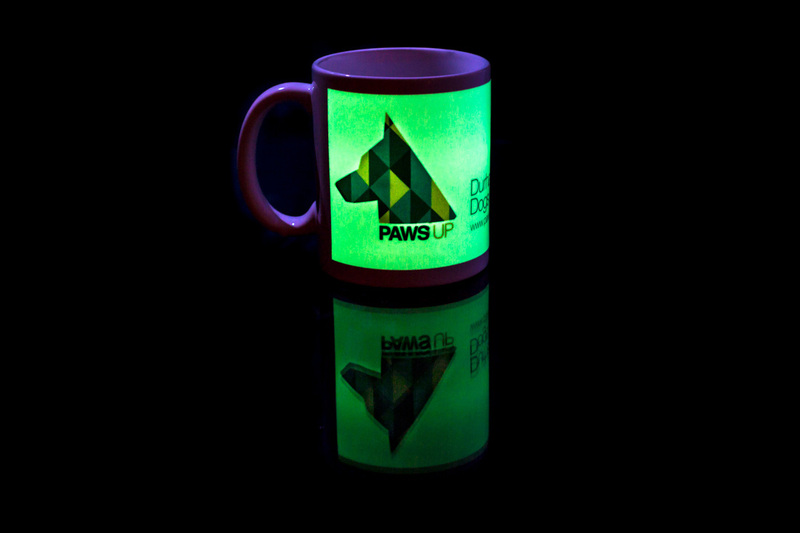 Poll - Glow In The Dark Mug! Have a go at voting to tell us what you think. 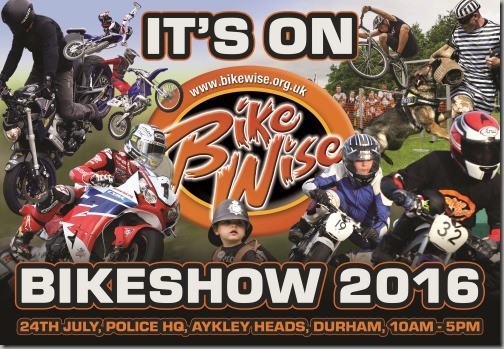 Durham Constabulary's BikeWise event will be held this year at the new Aykley Heads Police HQ. There will be a PawsUp stand where you can come and meet some of the team to find out more about the fund, how it can help retired dogs, how YOU can possibly re-home a police dog & of course purchase PawsUp merchandise! Naturally(!) 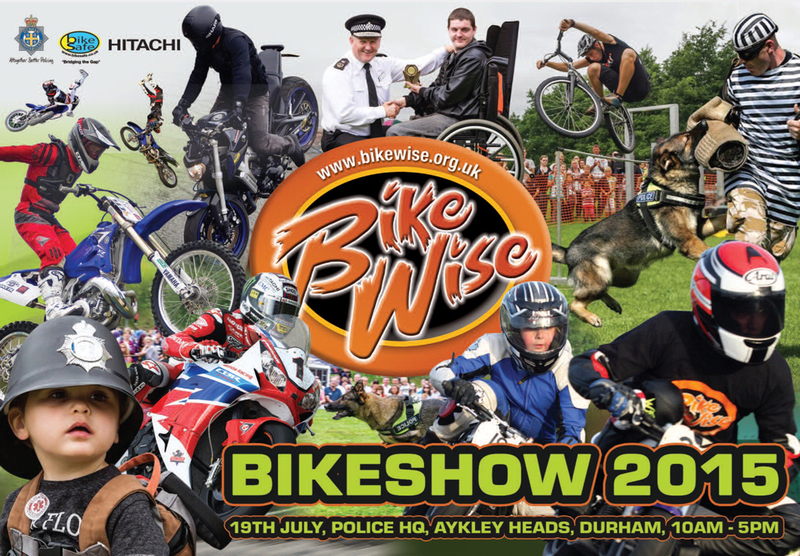 we have a BikeWise photo gallery where you can see photos of our displays from over the years - click on the link below. Hope we see you all there! 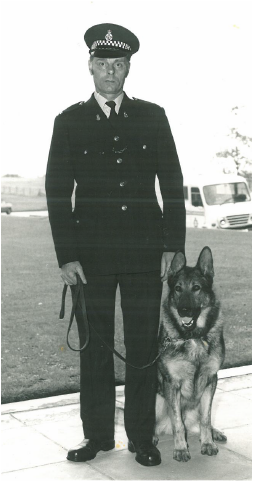 PD Nero is pictured here with his handler PC 1482 Arthur Charlton who was a handler for 26 years & an instructor for 3 before he retired in 1993. (The information & photos used have been kindly passed to us by his Granddaughter & taken from an email she sent to us). 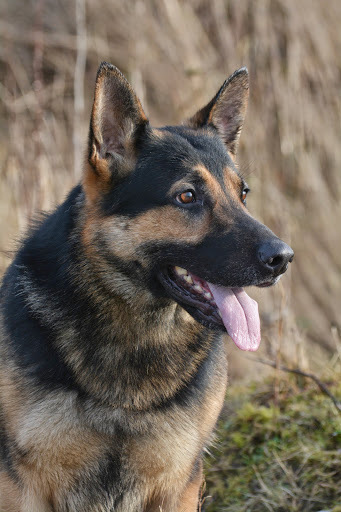 Nero was born in 1976 and was a county bred puppy, with the Kennel Name ‘Aycliffe Pedro’….Granddad changed his name to Nero so he wouldn’t have to shout PEDRO in public! Nero also took part in many competitions and won the Additional Police Dog Trials in 1982. Nero once went missing after taking part in a search and rescue; a girl found him in the woods and tried to take him back into Bishop Auckland. To the girl’s surprise, Nero (apparently) recognised where he was and found the Police Station and barked until someone came to find him! Quite clever for a dog who thought eating a plastic beef burger was a good idea; and who thought he could fit a garden clothes prop through a door…lengthways! Nero now has his own page in the pre-paws up section of our website & it can be viewed by clicking here. Mr Arthur Anderson & his Granddaughter attended the public open day of our new Police HQ at Aykley Heads. There is a photo album for the day which can be viewed via the Galleries page. Retired PD Archie turns into a Bloodhound .. ! Archie the springer spaniel has become a blood hound. Stressed out by his job as a sniffer dog with the force, the four-year-old retired from active service earlier this year to live with new owners on Tyneside. Now fully recovered and back on top form Archie is officially registered as a canine blood donor. After he was given a clean bill of health, his owners responded to an advert in his vet’s surgery appealing for voluntary donors. 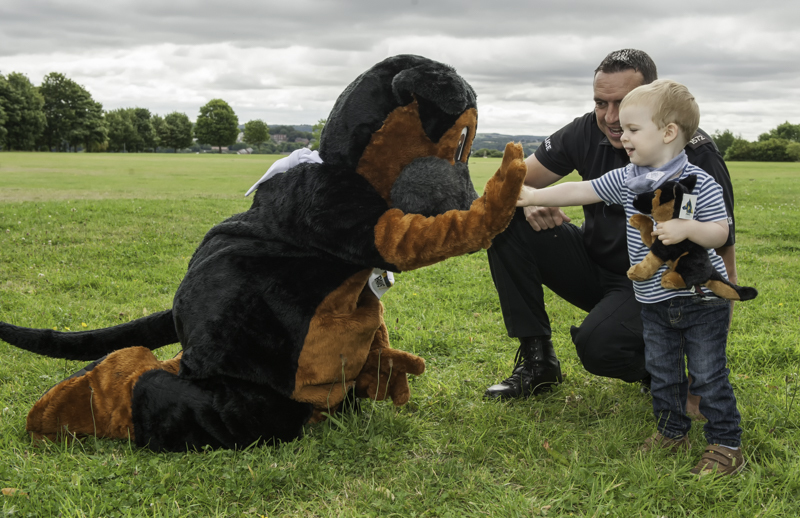 In the finest traditions of Durham Constabulary Archie agreed to put his best paw forward. 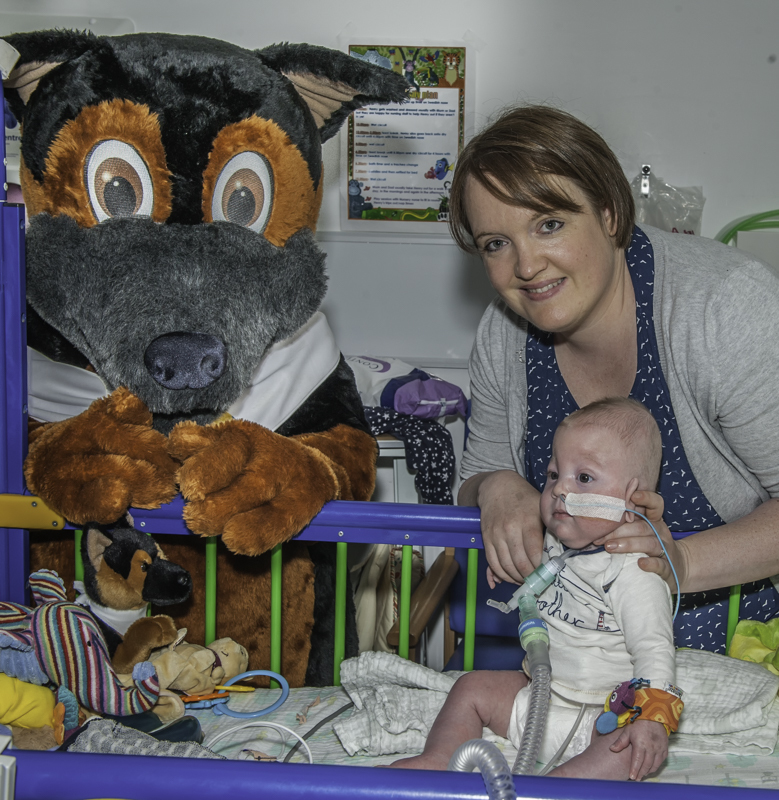 Archie is shown in the picture being handed over to his new owners - John and Denise Parker, in March this year. John and Denise are involved with 'Husky Rescue' and regularly attend our DogWise events. This year they brought Archie with them, and it was great to see him back to full health and clearly enjoying his retirement. Mike was born in York and joined the Metropolitan Police in 1988. He became one of the youngest in service officers to be given his own 'patch', and served on the Divisional Crime Squad, Murder Squad and TSG (Riot Police). He transferred to North Yorkshire Police in 1997 as he missed the countryside.. and fly fishing ! He became a rural beat officer, and eventually, a wildlife officer. In 2005 he starred in the BBC's 'Country Cops' and was inspired to write about his adventures in the North Yorks force. Mike left the Police in 2007 to become a professional author, and his first book ''Now Then Lad'' smashed the Daily Mail's book club record, following it's serialisation in the newspaper. Four other best selling books have followed.. ''You're coming with me lad'', ''Not on my patch lad'', ''Just the job'', and recently released ''Up beat down dale''. Mike's books were picked as the Radio 4 'Book of the week'. Mike served nearly twenty years in the Police, during which he became one of the highest commended officers. Following the UK riots in 2011 he has become a key spokesman on current policing issues in the UK, giving extensive interviews on on national UK radio and television, and giving extensive interviews on 'all things policing' for the BBC, ITV and SKY news. He is also an excellent after dinner speaker. Mike has just finished his latest works ''Pannett's Yorkshire'', a photographic book due to be released in hard back on October 1st this year. Future works will include his childhood memoirs and his Metropolitan policing time. He has recently assisted various government agencies acting as a 'consultant' and is currently working with SEPURA Ltd looking at innovative ideas and efficiency within critical communications for policing. We hope you like the new website, please be patient as we continue to develop it as some things are not 100% as we would like it just yet. As we get the hang of our new site we will add more exciting features for you to view & interact with, keeping you up to date with the dogs you so generously support. 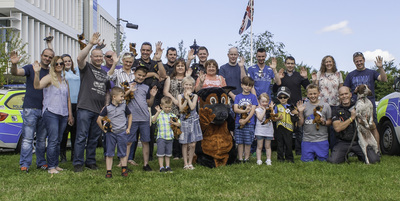 Sunday 24th May 2015 saw another family fun day and fundraiser, hosted by Stray-Aid. The event was held at Hardwick Park, near Sedgefield, Durham and was extremely well attended. 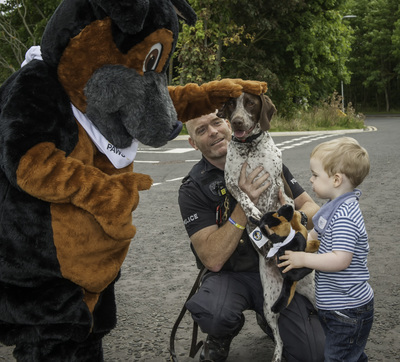 Some of the Durham Dog Support Unit attended and got involved in judging the different dog classes, as well as putting on a short Police Dog demonstration and promoting PawsUp. Click on either of the images below to view a slideshow of some of the pictures from the day. Durham's annual Easter Egg Run is happening again this Easter Sunday. This is a hugely popular event that will again see hundreds of motorcyclists riding from Durham to Darlington Memorial Hospital and then back to University Hospital of North Durham, where they will deliver Easter eggs and toys to the respective children's wards, and raising a generous amount of money for nominated charities. 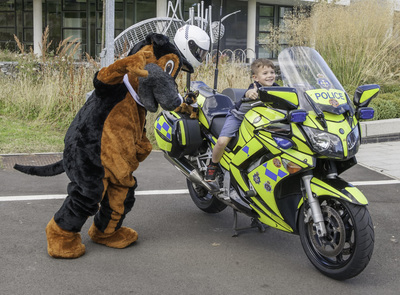 This is actually a hugely popular national initiative, supported by motorcyclists from all backgrounds, with a common goal of making Easter a bit more enjoyable for the children who can't be at home to enjoy the festivities. We at the Dog Support Unit have, for a long time, enjoyed a good relationship and affiliation with this event, and a few of the unit are regulars at the Easter Egg Runs. 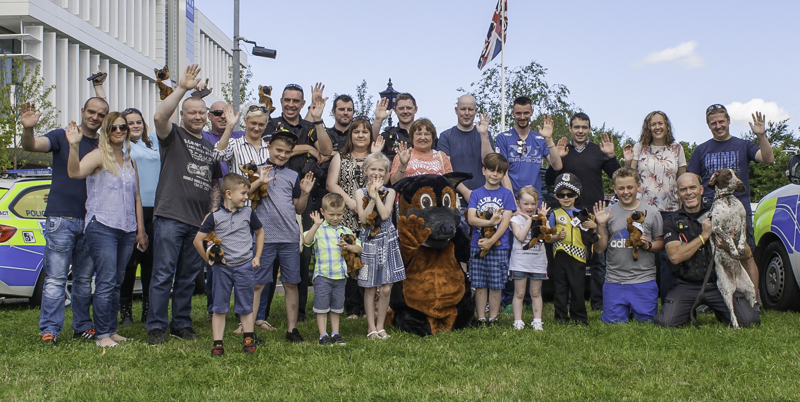 With this in mind, a few of the 'PawsUp' gang will help in keeping the tradition going by helping and supporting the hosts of this years event. We want your help by donating whatever you can, and promoting the event however you can. The link below is a dedicated FaceBook page set up by this years chief organiser - Tony Hudspith. Please share this link with all your friends and followers and help us spread the word. 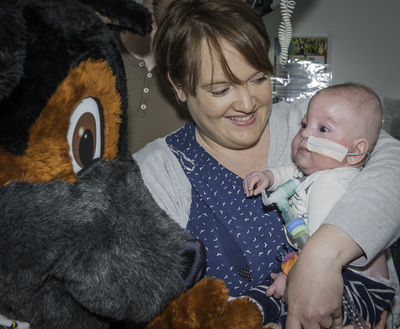 Every year, the public's generosity ensures that literally hundreds of Easter eggs are donated, but we are always keen for other donations such as toys and cash that can sometimes be used to better effect for the children's wards and also local children's charities. The 'PawsUp' gang will be at the meeting point (Tesco;s, Dragonville, Durham) where we are hoping to have some hot and cold drinks for sale. We will have a few of the dogs with us, so whether you're taking part in the ride or not .. come and say hi and donate something for a truly great cause. 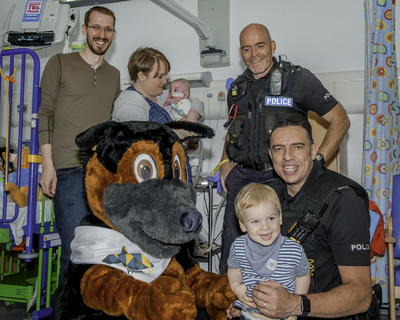 Please drop off your Easter eggs / toys / donation (voluntary) at any of your local Police stations, including HQ reception at Aykley Heads or with us at the Dog Support Unit. Make sure all items are clearly marked for the 'Dog Support Unit (DSU) Easter Event' so that we can collect them easily at various times throughout the next couple of weeks. 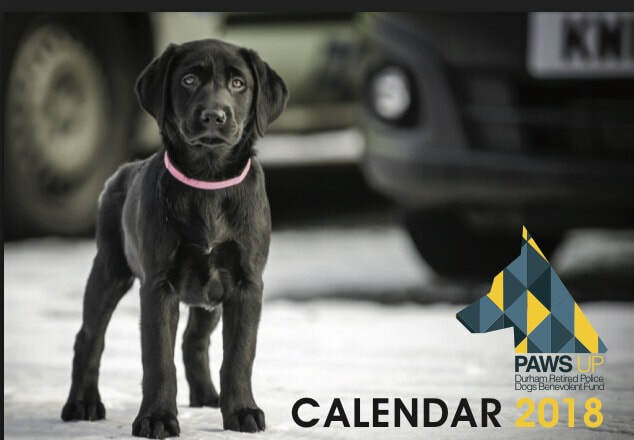 If possible, please drop us a quick email at durhampolicek9@gmail.com to tell us where you have left your gifts. Many Thanks in advance, and here's looking forward to brightening up Easter weekend for some poorly kids. IT'S BACK ... !! 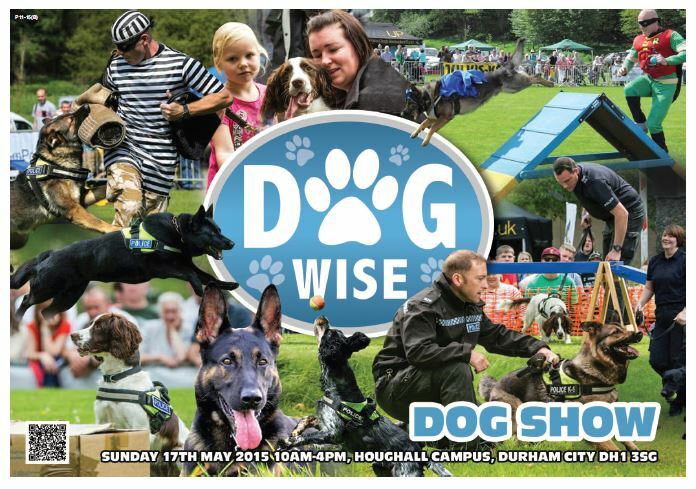 For it's 3rd year, DogWise returns to Houghall College Campus on Sunday 17th May. 10am - 4pm. Dogs welcome - under control and on a lead please.